Now, my friends, is the time to buy buds and other fresh material. Why, you may ask? – because October and November is harvest time for outdoor cannabis plants, at least here in California. Using Leafly.com, Weedmaps, and the websites of individual dispensaries that we have visited previously and liked, we research who has what strains and how much they cost per gram. We shop (cash in hand), buying mostly buds, hopefully at great prices. For our purposes, we look for strains that have a high ratio of CBD:THC as well as indica characteristics, plus some sativa hybrids. You may need other variants. Know before you go what strains would be best for your health problems (or for the person you are treating). Budtenders are there to help, and many are very caring and knowledgeable about what their store carries, but they cannot replace your own research ahead of time. We shop with a list based on what worked before, what the websites say is available, and what we can afford to pay. 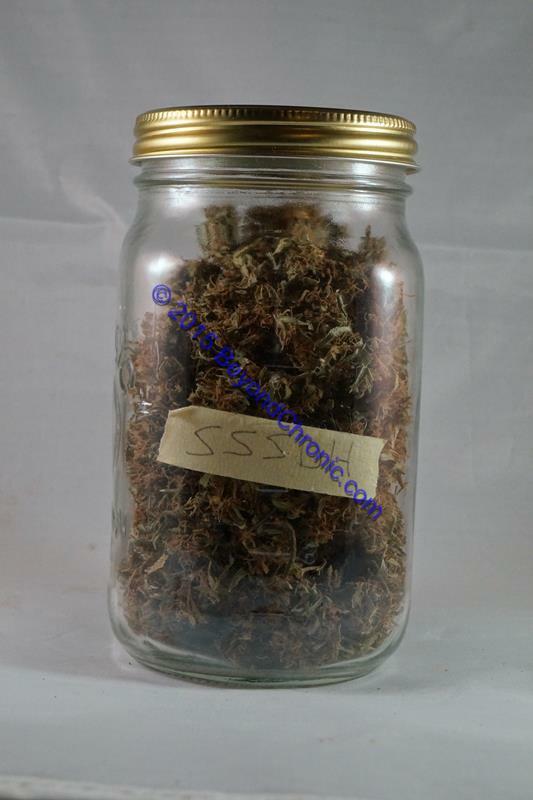 There are generally great bargains available for the next 6 weeks, and often almost insane deals on shake and leaves…we’ve seen less than $50/ounce even at retail, perfect for making butter and edibles! Once home, the buds are processed through the steps of decarbing and infusing coconut oil. The finished oil is stored in tightly closed and labeled mason jars for later use in capsules. We try to buy enough to be able to use our Magical Butter Machine (we need at least 1/2 ounce for that). Sometimes we don’t have enough of one strain to use the MBM, so we mix similar strains in one batch of oil. Occasionally, Old Hippie finds an old stash of unlabeled mystery buds, and we add those after guessing wildly what strain it might be. Be warned, if the buds are old and dry, there’s no telling what effect the finished product will have, even if you know the strain. In old cannabis (harvested more than a year ago) CBN starts developing as a degradation product of the THC. CBN will relax, or even sedate, many people. Many times these old bud mixes have proved to be quite strong, but with sometimes unexpected results. 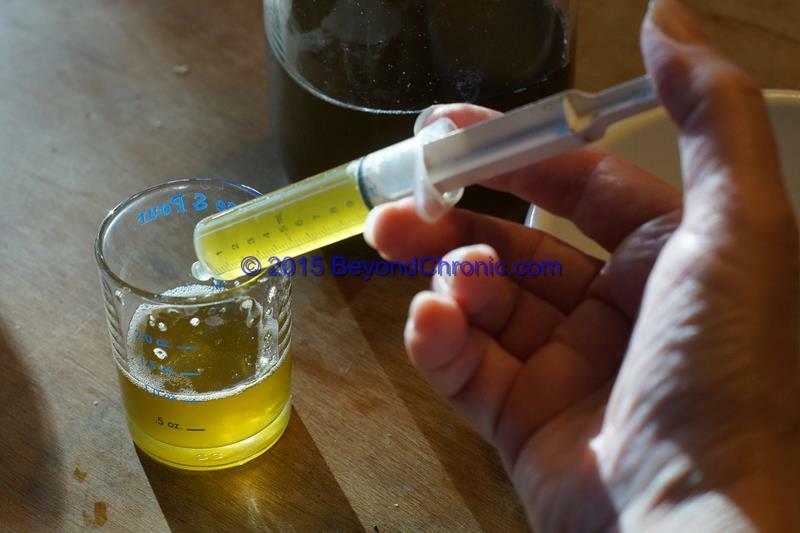 Before we make any Canna Caps, we test the oil using a calibrated oral syringe to take a dose. A #0 capsule holds about 0.6 ml of infused oil. And then we wait, sometimes for a full 12 hours, to see what the complete effect is. A too-weak result is rare, but if the tested amount does not have a noticeable effect, we will double the dose (1.2 ml, or 2 capsules’ worth) and repeat the test. Or if we really don’t want to test again, then we mark the weaker capsules as “light”, so we know to always take at least two for an efficacious result. Light capsules are also safe to take with regular strength capsules without overmedicating (getting too high). If the result is very strong, we dilute a few ounces of the infused oil with untreated coconut oil to make a smaller amount of diluted oil, generally either 75 % or 50% strength, and test again. We are always careful to mark the undiluted jar as containing 100% of whatever it is. This way we can come back and make more capsules in whatever concentration we need. When the dosage it is just right, we make capsules. Taking one finished jarful of infused coconut oil, we make a batch of about 100 capsules. This takes about two ounces of the already prepared infused oil. The finished capsules are put into a medicine bottle and labeled. Some labels are literal strain names like “Odyssey”. Old Hippie also coins more imaginative names like “Frankenstein Oil” or “SSSS Mamba” for some of his strain mixes. The latter are the strongest capsules, used for treating panic attacks or when suffering from the complete inability to sleep. One or two weeks after buying our freshly cured plant matter, we have enough infused oil and capsules to last us for months. Mission accomplished! Ha ha! You can get your own jar at Walmart though. Once you have infused the coconut oil, can you just store it in the fridge or freezer forever and halt degradation? What’s been your experience? My thoughts are to buy enough shake to last me till next year. THC keeps quite well when stored properly in bud form (cool and dark in glass jars after curing), pretty much good as new for 6 months and then degrades fairly linearly afterwards over a period of 1 to 2 years (and let’s assume CBD does about the same, although I have no actual data). Once it’s dissolved into coconut oil, our experience is about the same, although we tend to keep our bulk oil at room temperature. We store our capsules in the refrigerator and it seems to take at least a year before we notice any difference, and even that would be fairly subtle. So I’d say if you can stock up now on enough shake to make oil or capsules, you can make them over the winter and they should be fine until next harvest season. Nugs and hugs! Sorry, we don’t sell anything except books, and especially not marijuana!